One of the nicest parts of working on a farm is making friends with so many new people. Sometimes our new friends aren't people though! Come introduce yourself to the four legged members of our Barn! Derby and Matilda are the oldest goats we have on the farm. 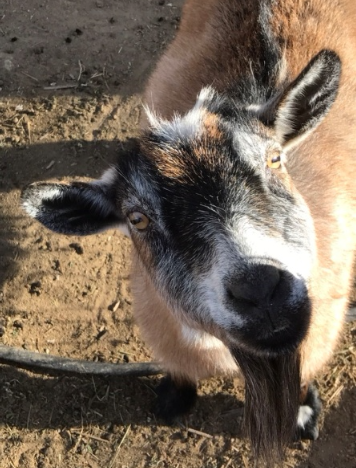 Derby got her name because she was always the fastest goat on the farm. She loves climbing and can usually be seen lounging and relaxing on top of the shed in her pen. Derby is usually shy around people, unless you’re trying to feed her, then you’re her best friend. White/ Cream/ Brown Nigerian Dwarf goat. Matilda is the most relaxed goat on the farm. Nothing scares her and she loves back scratches and food. You can find her laying by the feeders. Unlike Derby, Matilda does not like to climb. Beards on goats are not uncommon, female goats can have beards as well, though it is less common. Beards all boil down to genetics. Both Derby and Matilda have beards! 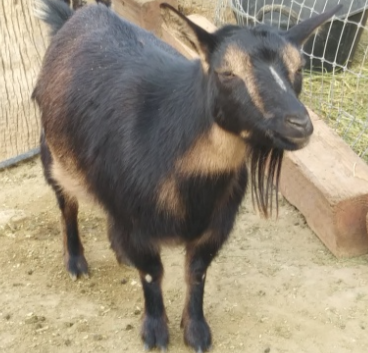 Olaf is the only male Norwegian Dwarf goat we have in the big pen and he is definitely a lover. He adores attention and scratches. Just like the snowman, he is mostly white. Has never built a snowman, but would like too. Schedule a Tour or Birthday Party here! Elsa is the queen in this kingdom! Born in 2009, she's a rescued Shetland pony who adores snacking on Strawberries from the patch. She can be shy with strangers at first, but becomes good friends with regular visitors. Has a poster of Seabiscuit under her Haybed. Our newest lamb on the farm is Timothy. 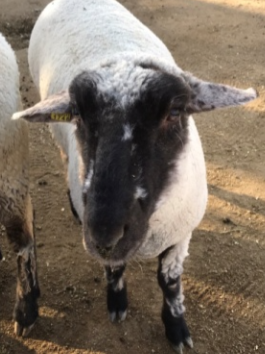 Timmy was donated to us after being showed at the 2017 Kern County Fair. Timmy and Dave are nearly twins, but Timmy is obviously the little brother. He's super friendly! If you see him jump up on the gate then make sure to give him a scratch! He loves attention. Mostly wears Dave's hand me down wool. Speck was also shown at the 2017 Kern County fair. He looks very similar to the other lambs but he has white speckles on his face. Speck isn’t as outgoing as the others, but he's very good friends with Elsa. Speck and Derby train Elsa to be the smallest race horse in the Kentucky Derby. They're coming along just fine! Here we have the second biggest in the pen, Dave. We call Dave Princess because he is very high maintenance and needs a ton of attention! Dave hates summer and tends to get really lazy around that time. If you see a sheep laying around, it's probably Dave. Why is Goat cheese so delicious? Because it comes from the best "Head-Butter"! What’s with all these terrible puns? Anna is the biggest sweetheart in the pen and enjoys playing and interacting with people. She has been caught making dragon noises while running around the pen when no one is around. 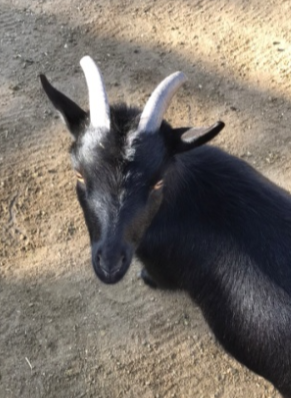 FunFact: Calls herself "Mother of Goats"
name because when she was bottle fed she would drink all of her milk and try to drink all of baby’s milk too. Watch your hair and loose clothes around her, she likes to nibble. FunFact: Fatty is a very picky eater, but is willing to try everything atleast once. Prefers the taste of Cotton shirts. Baby is the smallest goat in the pen and Fatty’s little sister. She earned her name because she didn’t eat very well and we had to swaddle her to get her to drink from the bottle. Baby is the most docile and calm tempered goat. FunFact: Baby wears a fake beard to fit in with The Golden Girls. The goats in the Parking Lot pens are the most well known. 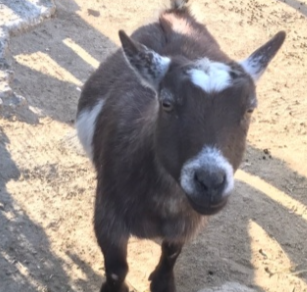 If you happen to be stopping by the farm but don't have time to visit the play area, you can still come visit these furry friends by walking along the edge of their pen in the west end of the front parking lot. Don't forget to load up on quarters for the feeding machine! The sound of the gears releasing kibble makes their little Capra Aegagrus Hircus hearts sing! This little brown speckled one is Cutie Pie. Her name is fitting for both looks and personality. She is the sweetest and most docile in this bunch. FunFact: Cute Pie has started to request protein infused hay. She says if she bulks up the other goats will take her more seriously. 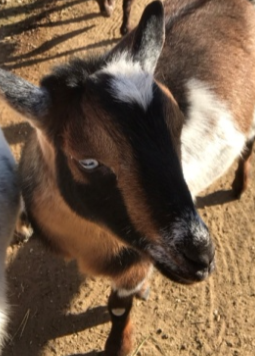 Georgie is the most popular goat in the pen. He has blue eyes and the coolest markings of the bunch. Georgie came to us after he hurt his leg and needed special care. The vet was able to fix him up but it healed two inches shorter than the other leg. It doesn’t hurt him but he does wobble a bit when he plays! FunFact: Georgie and Dolly are going steady! This is Dolly! She tends to be very skittish, but gets alot more friendly when you have a snack! She went to school to become a Cow, but decided life would be easier as a petting zoo goat. She still wears her Cow uniform. FunFact: Dolly got her degree in Chocolate milk production and spent some time as a Yoohoo cow. Grandpa Walter was the wisest of all the goats, and he was said to have traveled with Billy Goat Gruff on his tour of bridges. Grandpa Walter will forever be missed by everyone who ever knew him.